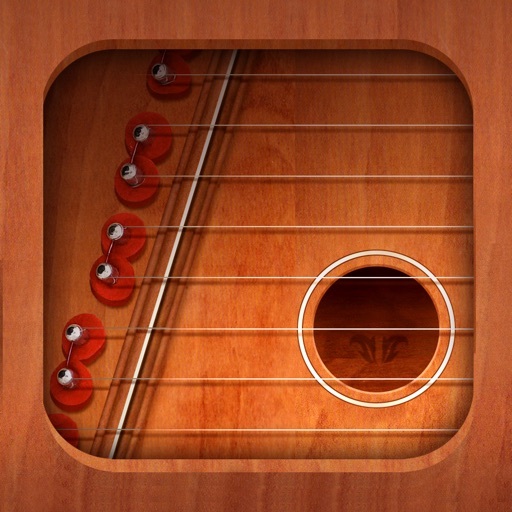 The Air Harp app does an excellent job reproducing the sound of a harp. 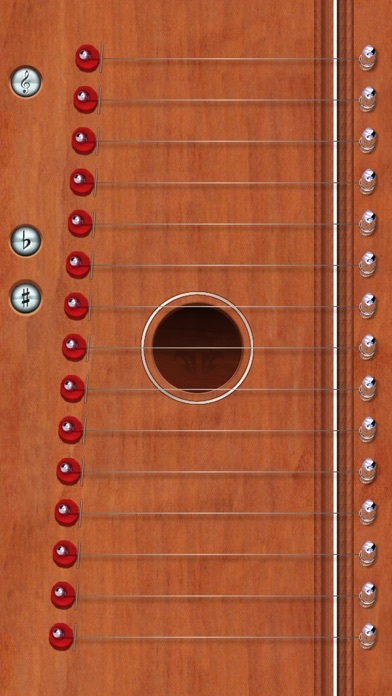 The virtual harp has 15 strings representing two octaves of notes in G Major. 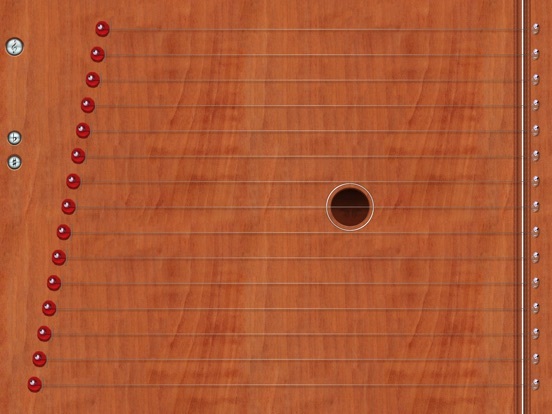 You can now also alter each string and play it sharp or flat by tapping and holding the corresponding key on the left panel. That's 30 additional notes! 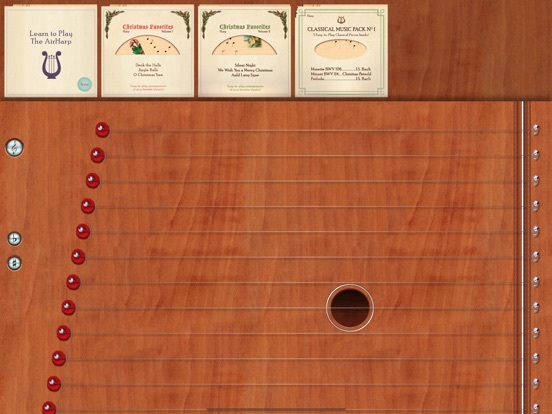 Tap the strings to create your own tune, or use sheet music to play a well-known song. 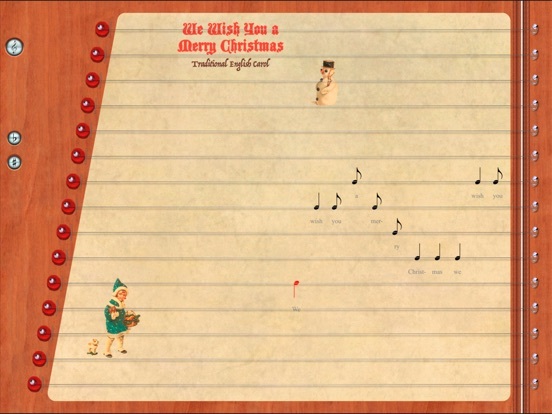 The app includes several pieces of sheet music, and you can buy additional collections for 99-cents each. Air Harp is enjoyable and relaxing for the music-oriented adult. Unlike other music apps which require you to tap falling dots on a screen, the app uses real notes and strings which makes it an excellent learning tool for children. Fantastic! - I own a lot of apps that I use to create music and design sound, but this is the only one that can put me into a euphoric state while playing it. Truly, you have created something of great value and beauty. I would give it a hundred stars if I could. Thank you. I love it! - I think i'm going to cry soon! IT'S JUST SOOOOOO BEAUTIFUL! NEW & IMPROVED! In Version 4 you will find great features for the iPad that our fans have been asking for. Tap & Strum are now combined to make a more fluid playing experience. 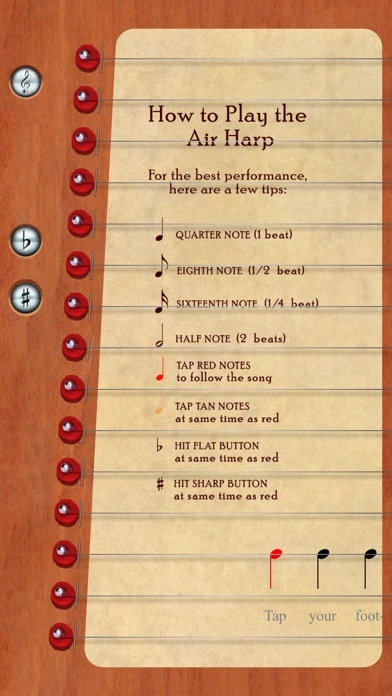 Plus, multi-page music support for sheet music. 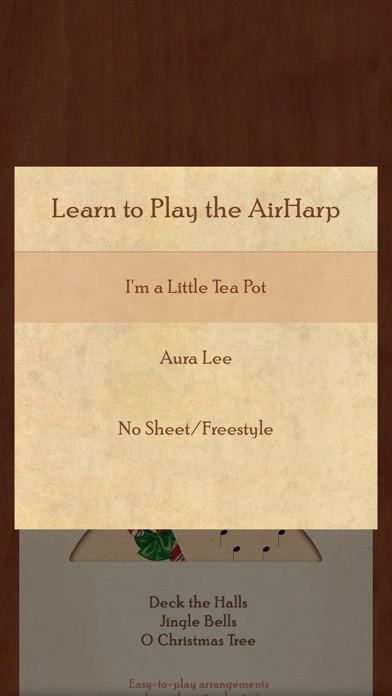 Air Harp, re-imagines the classic lap harp for the iPad platform. Designed above all to be fun and easy to play, the Air Harp offers a delightful musical experience for people of all ages. Strum and pluck the strings for a lovely sound. Anyone can make beautiful music with the Air Harp! 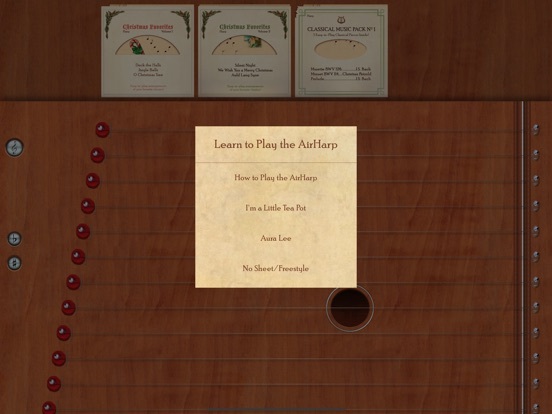 Play your favorite tunes by ear, or choose popular songs to play and sing along to from an interactive sheet music library. 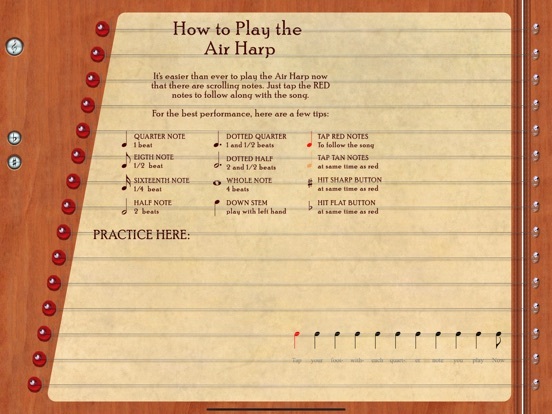 The Air Harp includes 2 octaves (15 strings) of gorgeous, high-quality harp tones in G Major. * The ability to compose and record your own sheet music! 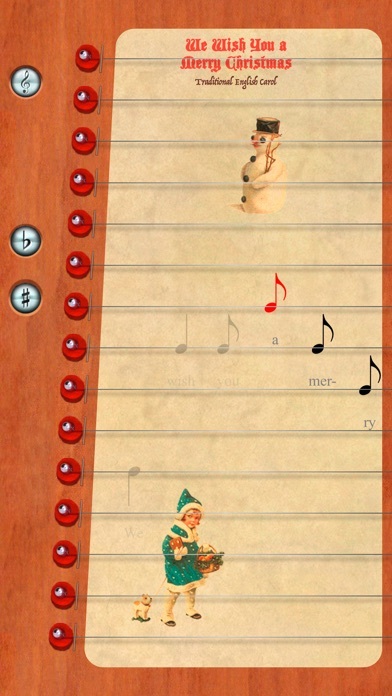 * Air Harp brings the classic fun of a lap harp to the iPad! * Great for adults and children alike. Anyone at any level of musical ability can play wonderful music on the Air Harp. * Easy-to-read sheet music system. Just pick a song, and slide the music under the strings, and pluck the notes along the strings according to the diagram. 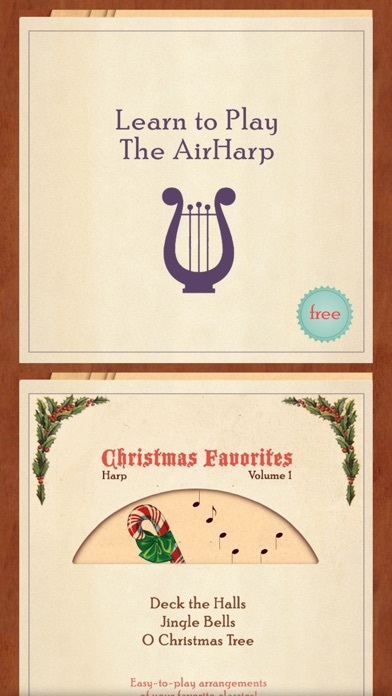 * Air Harp includes sheet music for 2 popular songs for free, and more packs to buy. Invite friends and family to sing along while you play! Beautiful new music pack - Relaxation 1. Don't worry, AirHarp fans: all previous music packs that you have purchased in the past will be restored soon and available on both iPhone and iPad. This version also fixes some issues users were having with sound not playing.